Season’s Pass Program for National AFP Members Only! Transferable to a colleague if you are unable to attend any of the seven events, not including NPD. The Season's Pass Program is for meeting attendance and is not for membership in the chapter or AFP National. 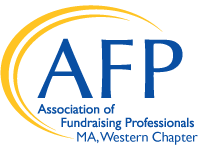 You must be a current member of Association of Fundraising Professionals in order to participate in this pass program. Not a member? Click here for information on becoming a member. Not sure? Contact chapter administrator.